Young women undergoing chemotherapy experience acute changes in ovarian reserve that recover in the months after therapy is completed. The rate of recovery of AMH is impacted by pretreatment levels. Katherine E. Dillon, B.A., Mary D. Sammel, Sc.D., Maureen Prewitt, R.N., Jill P. Ginsberg, M.D., Dana Walker, M.D., M.S.C.E., Jennifer E. Mersereau, M.D., M.S.C.I., Yasmin Gosiengfiao, M.D., Clarisa R. Gracia, M.D., M.S.C.E. To identify factors associated with ovarian reserve impairment during and immediately after chemotherapy. Forty-six adolescent and young adult women with a new diagnosis of cancer requiring chemotherapy. 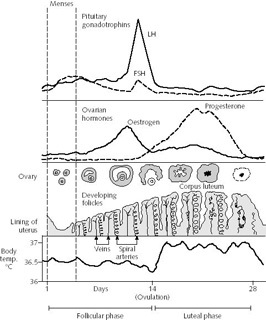 Measurements of ovarian reserve via levels of serum follicle-stimulating hormone, luteinizing hormone, estradiol, inhibin B, and antimüllerian hormone (AMH) as well as antral follicle counts and mean ovarian volume at 3-month intervals. Changes in ovarian reserve were quantified for both the acute impact of treatment using linear regression and the longitudinal recovery after therapy using mixed-effects models adjusted for baseline ovarian reserve, use of alkylating agent, and hormone use. The women had at least one pretreatment and two posttreatment study visits (mean follow-up interval: 12 months). All measures of ovarian reserve demonstrated statistically significant changes during chemotherapy. Alkylating agent exposure and baseline ovarian reserve were acutely associated with the magnitude of impairment, and pretreatment AMH levels were associated with the rate of recovery of AMH after treatment. In adjusted models, participants with a pretreatment AMH level >2 ng/mL recovered at a rate of 11.9% per month after chemotherapy, whereas participants with pretreatment AMH levels ≤2 ng/mL recovered at a rate of 2.6% per month after therapy. Baseline ovarian reserve and alkylating agent exposure effect the magnitude of acute changes in ovarian reserve from chemotherapy. The rate of recovery of AMH is impacted by pretreatment levels. This should be considered during pretreatment fertility preservation counseling.